On the 2 pages of notes, students will practice finding the volume of right and oblique prisms and cylinders. Cavalieri's principle is also introduced. There are 10 "let's try" problems throughout the notes for the teacher to guide the students through or to let students try on their own. The one practice page consists of 10 problems in which students will have to apply their knowledge of finding the volume or one dimensional component of a prism or cylinder. 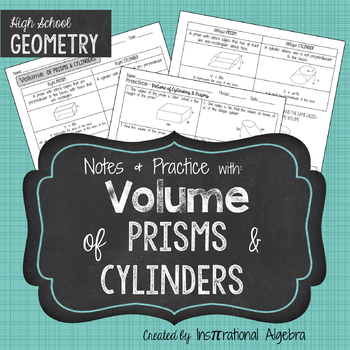 The notes page could be used in class to find the volume of prisms & cylinders or as a review. 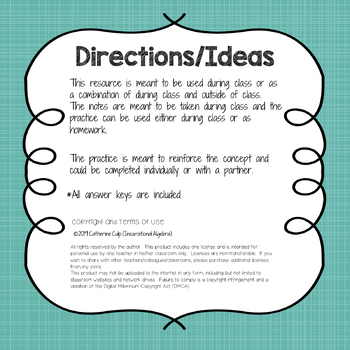 The practice page could be used in class as individual, partner or small group work or as homework. All rights reserved by the author. This product includes one license and is intended for personal use by one teacher in his/her classroom only. Licenses are non-transferable. If you wish to share with other teachers/colleagues/classrooms, please purchase additional licenses from my store. This product may not be uploaded to the internet in any form, including but not limited to classroom websites and network drives. Failure to comply is a copyright infringement and a violation of the Digital Millennium Copyright Act (DMCA).